Harvard’s Ronald Ferguson writes about the racial achievement gap in education. A Cleveland native, Ronald Ferguson first came to Boston to attend graduate school in economics at MIT; since 1983, he has taught at Harvard’s Kennedy School. 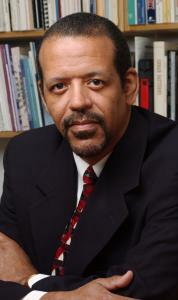 Ferguson, whose most recent book is “Toward Excellence with Equity,” is noted for his work on economics and student success, and on the racial achievement gap in particular. He and his wife have raised three boys. He spoke to us from his Cambridge office. I don’t read anything that doesn’t have to do with work. When I want pleasure, I’ll watch a movie. When I read, I’m writing something specific, and I’m looking for books that will help me understand that. What qualities do you look for in those books? I’m looking for people who have asked similar questions to the ones I’m asking. But I tend to read in a critical way. Those of us who are researchers don’t really take anybody to be an authority. You’re learning from what they’ve written, but you’re also thinking about how you might reformulate it. I’ve got thousands of books. I’m looking at a wall that’s probably got 200 books on it. I could tell you what each is about, but there’s not necessarily one where I’d say, “This is the one people should buy.” Except maybe mine. Did you always read skeptically? I was trained to do that, as an economist at MIT. I could talk about books like “The Souls of Black Folk” or “Black Man of the Nile,” things that struck me as an undergraduate. But as an economics major, you’re reading in order to learn tools — to understand how to build models and estimate equations. You’ve been able to draw a correlation between academic success and how many books a family owns. High-quality time on task in almost any learning activity is going to give you learning results — practicing math problems, studying your science, reading. In the survey work that we do, people’s estimates of how many books they own help to predict grade point averages for middle and high school students. Did you grow up in a house with books? I had one special summer, after second grade, maybe, when I joined a book club and they would send a book every couple of weeks. They were storybooks. One was called “The Phoenix.” I just remember the title. It was a story of one of these birds that is reborn every 500 years. That summer is the summer that I developed a love of reading. Did you read to your kids? We read to them through elementary school, at bedtime. They all had full bookshelves of books and favorite things to read. But we stopped reading to them around fifth grade and encouraged them to find things they wanted to read on their own. Once in a while, when they were around 16, 17 years old, we would pull them all together to sit in a room and read something. One evening, we’d pick up a book that had some meaty issues in it, pass it around, each read a page or two, and talk about it. We probably only did it two or three times — everyone was so busy. It was always a rich conversation, to hear their interpretations. Yeah, it was. I don’t remember what we read; I just remember being impressed with their thoughts.